Spaceport America Final Design Looks Like Millennium Falcon | OhGizmo! Despite my still tender age of twentysomething, I never thought I’d live to see the construction of an honest-to-goodness commercial spaceport. But by 2010, Spaceport America should be completed and operational out in the New Mexico desert (somewhere around here). The winning design is a 100,000 square foot, $31 million facility designed to be a “Destination Experience,” which is supposed to mean that (since you probably can’t afford a ticket) you’ll be happy just visiting. I’m not too sure about that, but the building is pretty neat looking in a Star Warsy sort of way, and it’s promised to be environmentally friendly and energy efficient. The primary tenant is going to be Virgin Galactic (no surprise there), but the building will also serve as headquarters for the XPrize Cup and the Rocket Racing League. No, it looks like a toilet seat. That render used above is terrible. Shadowing obscures rather than enhances the 3 dimensionality of the objects in the render, so I have no idea what half of the structures are here. Where’s the bathroom i gotta take a dump. THIS ship! !” Darth:…. *sigh* Performs death grip on Alien Chinese dude wearing turban killing him instantly. Excellent design. Very futuristic, this will be an amazing building once completed. 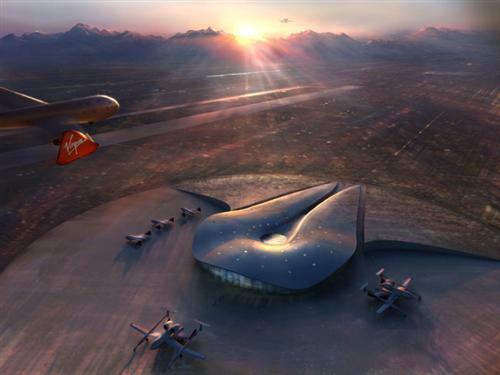 It’s a perfect design for the world’s first Spaceport. Hopefully there will be more that follow across the world, and all will have designs as good as this one. Sir Norman Foster is trully a great architect. This looks like something straight out of a sci fi show or movie.